Subject: Is the Stock Market Too High? The Dow, S&P 500, and Nasdaq all closed at record highs on Friday (Feb. 10) after President Trump announced a "phenomenal" tax plan in the coming weeks. The Dow alone has surged nearly 12% since Election Day. But this record-breaking run has some investors wondering, is the stock market too high? The three major indexes have climbed a combined 11% since President Trump won office on Nov. 8. Observers have dubbed this growth the "Trump Rally." Forbes chalks the growth up to optimism over President Trump's "pro-growth policies." In short, the prospects of lower taxes and fewer regulations have investors excited enough to buy. But with most of the gains coming before Trump was sworn in as president, and only three weeks of time in office since then, some believe the rally is premature. "I think markets are ahead of themselves," Larry Fink told a Yahoo Finance forum Monday (Feb. 13). Investors like Fink believe the stock market is too high. And an overvalued market could lead to a stock market crash. The stock market is too high when stocks are selling for more than they are really worth. And when the market corrects, a stock market crash could follow. You see, speculation drives stock prices up. During times of "irrational exuberance," investors are willing to take big risks. In the case of the stock market, they expect stocks to continue rising. That's how speculation pushes prices higher, which leads to a stock market bubble. But the problem is stocks don't always rise. When the market falls, speculative investors are forced to sell. And mass sell-offs drive the market down even further. This is what causes the stock market to crash. We've seen this happen during historic stock market crashes, like the stock market crash of 1929. During the Roaring '20s, investors believed that the surging market would never fall. They took huge risks by piling money they couldn't afford to lose into stocks. Investors borrowed over $120 million to invest from 1923 to 1929. All of this money helped inflate the stock market, but when the market began to fall in 1929, investors panicked. These investors were forced to sell because they couldn't afford to lose the money. And as stocks continued to fall, even more investors sold. Some stockholders couldn't find anyone to buy their shares at any price. The stock market crash of 1929 would wipe out 86% of the value of the Dow between 1929 and 1932. And now that the stock market is breaking records again, we are seeing these same signs of speculation driving up stock prices beyond their real value. The Shiller P/E ratio is a measure of stock market value. Robert Shiller, a Nobel Prize-winning economist, developed the ratio as a way to value the stock market. It helps us understand whether stocks are too high or too low. 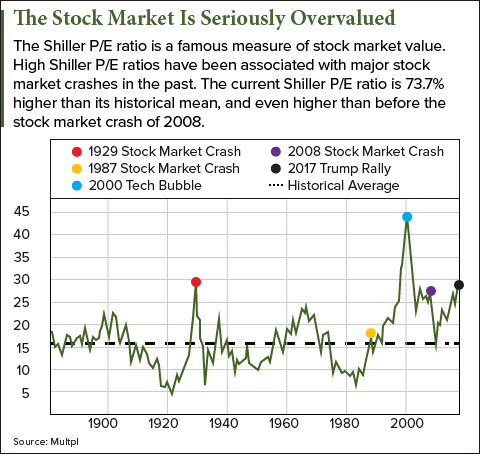 While we can't predict when or if the stock market will crash, we do know it's overvalued by historical standards. And that could mean a stock market crash is coming. How to Plan If You're Wondering "Is the Stock Market Too High?"